One of the fastest growing and dramatically changing minority groups in the United States is the Asian and Pacific Islander (API) community. This group is comprised of people from Hawaii, Samoa, Korea, China, Japan, Vietnam, the Philippines, and South Asian countries, such as India and Pakistan, among others. The influx of both foreign-born and second generation APIs prompt those in the the social and mental health services an increased level of concern, as they attempt to accommodate the needs of a culture of individuals who generally avoid the use of their services. Development of a culture-specific framework for delivery of services is a matter of ongoing research and strategic implementation. In providing access to a culturally-specific resource, the variety of cultural representations of the API community must be taken into consideration: the differences in faith, educational level, socio-economic status, health condition, political ideology, past or current military background, home language, sexual orientation, gender identity, and generational and acculturation levels. Being lesbian, gay, bisexual, or transgender (LGBT) and/or having an LGBT family member in the API community is not a new phenomenon. It has been known scientific fact, though not readily (publicly) discussed; that the human species variations include sexual orientation and gender identity and that being other than heterosexual is not a choice, but is biologically-based. Beverly Toyama, and Clara Kramer. API LGBT activism on the West Coast dates back to the 70s era; from the San Francisco Bay area of Northern California to West Hollywood/ Los Angeles basin in Southern California. The original Asian Pacific-Islander PFLAG (API PFLAG) group was borne out of a response to a proposition that opposed marriage equality. A group of API parents, API LGBT, and API straight allies banded together to bring about awareness, inter-generational and inter-faith dialogue, by providing support in safe spaces to express concerns, put forth clarifying questions, and to access resources. Key people who began this movement were: Harold and Ellen Kameya, Beverly Toyama, and Andre Ting. Thereafter, new participants joined and collaborated: Marsha and Tad Aizumi, John and Minsook Brady. Still, API PFLAG was faced with challenges of sustainability and outreach to new parents whose children have just "come out" and including the API LGBT who struggled with "coming out" or questioned their sexual orientation or gender identity. Marsha Aizumi discovered that there was a large population of young Asian Pacific-Islander (API) LGBTs who have not "come out" and disclosed their sexual orientation to their parents. She observed that some LGBT children of Asian immigrants faced language barriers with their parents and, in addition, the fear of their parents' reaction. Even children of parents born in the United States still faced cultural problems, including the issue of Asian shame as prominent. API parents typically avoid talking about their LGBT children and are hesitant or uncomfortable to speak out in support of their LGBT children. 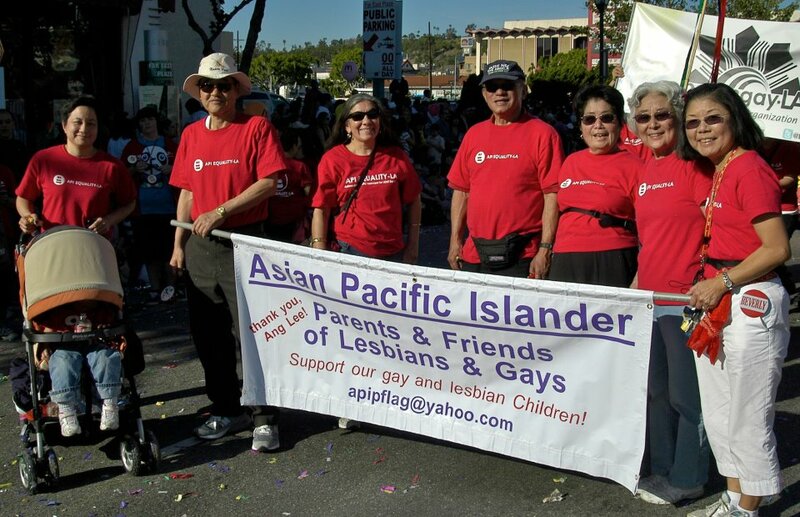 By February 2012, Marsha Aizumi, Andre Ting, Harold and Ellen Kameya, John and Minsook Brady, Terrenz Vong, and Tran Le, spearheaded the formation of this new support group, that would be known as the San Gabriel Valley Asian and Pacific Islander PFLAG (SGV API PFLAG). The San Gabriel Valley API PFLAG began meeting in April 2012. The SGV API PFLAG initially focused on building a strong group of API LGBTs. The goal was that, in time, they would bring their parents and/or family members to events where they can meet other parents. Providing a private space in a support group modality would be that safe space for beginning the dialogue and listening to others on the same journey. (Members with an asterisk* by their name are also available for contact (telephone or email) in various National parent networks. In March 2013, we officially applied to become an independent PFLAG Chapter. As of April 2013, we will have operated for one full year as a satellite program. By May 2, 2013, we became a 501(c)(3), non-profit organization. Our 2012 Leadership Team has evolved to comprise of: elected officers (President, Secretary, Treasurer), and a permanent Executive Board. Members of the original Leadership Team continue to participate in Board meetings: Tommy Tseng, Alan Chan, Eric Arimoto, and Terrenz Vong. Our participants include families, friends, allies and lesbian, gay, bisexual, transgender, and queer (LGBTQ) individuals of various Asian and Pacific-Islander descent (i.e. Chinese, Japanese, Korean, Vietnamese, Malaysian, Thai, Filipino, Hawaiian), including South Asian descent (i.e. Indian, Pakistani). We come from a variety of spiritual or faith communities (i.e. Catholic, Buddhist, Progressive Christian, atheist, agnostic, Islam). The diversity of representation of Asian-American ancestry, religious faith, socio-economic class, educational level, and political ideology of participants exemplify our primary mission of inclusiveness and community building. Support group meetings are held every fourth Sunday of each month from 3:00 pm to 5:30 pm unless otherwise noted. From April 2012 through March 2013, the meeting venue was in a private office at Ting's Building in Monterey Park, CA. We appreciate Mr. Andre Ting for enabling SGV API PFLAG to meet for free at his building located in the San Gabriel Valley, a centralized location accessible to the communities of Los Angeles County, San Bernardino County, and Orange County. Effective April 28, 2013, the meeting venue moved temporarily to the Aizumi building in Montebello. Our permanent meeting venue (to begin August 25, 2013) will be at: Sage Granada Park United Methodist Church in the city of Alhambra. Meetings are facilitated by Carol Mannion. Attendees are encouraged to bring refreshments to share with the group. Time for networking is made available before and after each meeting. Participants are also provided opportunities to learn of other organizations that provide services, as well as advocacy work, for and with LGBT communities in the Greater Los Angeles area, San Gabriel Valley, San Fernando Valley, Chino Valley, and Orange County areas. In addition, many parent participants are also active members of local PFLAG chapters, such as PFLAG Los Angeles, PFLAG Pasadena, PFLAG Long Beach, PFLAG Orange County, and PFLAG South Orange County.